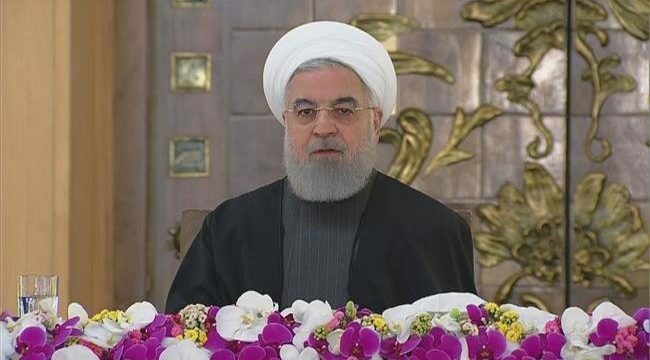 Press TV – Iranian President Hassan Rouhani renews Tehran’s call for a Middle East free of nuclear weapons and other weapons of mass destruction, urging an end to foreign interventions in the region. “Our slogan is a Middle East free of nuclear weapons and [other] weapons of mass destruction, and we have been standing firm in this regard for more than 40 years,” Rouhani said. Rouhani made the remarks while delivering a speech to foreign dignitaries and ambassadors in Tehran on Wednesday on the occasion of the 40th anniversary of the Islamic Revolution. “Our slogan is that the presence of foreign troops in the region and their interventions must end,” Rouhani added. “Our slogan is a world free of violence and extremism” as it was stressed in the World Against Violence and Extremism (WAVE) resolution submitted to the UN by Tehran. President Donald Trump of the United States withdrew Washington in May from the JCPOA, reached between Iran and the P5+1 group of countries in 2015, and decided to re-impose unilateral sanctions against Tehran. The Europeans issued a joint statement on January 31, announcing the launch of a long-awaited direct non-dollar payment mechanism meant to safeguard their trade ties with Tehran in the face of the sanctions. Iran and its three European partners in the JCPOA will soon begin talks in Paris, France, in an effort to work out the operational details of INSTEX. On a visit to Paris on Tuesday, Iranian Deputy Foreign Minister Abbas Araqchi reached an agreement with French officials to hold a first round of expert-level discussions in the near future on INSTEX. The mechanism has been registered in Paris and will be jointly financed by the three European countries and run by a German banker. It is initially intended to be used for selling food, medicine and medical devices to Iran, but it could be expanded to cover other areas of trade in the future.